This Council Transformation programme involved the creation of a new Civic Centre building comprising extensive refurbishment of an existing corporate headquarters building and the creation of structures to house a modern, flexible Council Chamber with many civic offices, customer centres, childrens area, contact centre and flexible working areas with appropriate large, medium and small, technology enabled meeting rooms. The various specialist consultants in the design team had completed RIBA Stage D for all aspects of the design but no real consultation had been undertaken to develop and agree the business and technical requirements for the very specialist Audio Visual technologies needed for the Council Chamber, Public Galleries, Face to Face Contact centre and meeting room facilities. This was particularly challenging because of the competing needs to maintain the aesthetic appeal of the chamber while ensuring that a range of technology supported meeting scenarios could happen whilst also ensuring that the room could be completely cleared of equipment to allow the space to be used for private hire functions. A fast-track approach was required and I prepared and delivered intensive workshops with all key stakeholders, drop in sessions for staff and prepared an innovative design which accommodated all of the planned modes of use whilst making the preparation tasks easy for the FM team responsible for managing the space. It was necessary to specify and have manufactured some bespoke cabling components to provide flexibility and ease of use. A contentious added element was the technology to broadcast council meetings on the internet. A market leading technology and service was added to the design for this purpose. I presented the resulting design concepts to the various review committees including the Members steering group. This agreed I prepared an output specification and a ‘should-cost’ model which was used to procure the solutions and subsequently assisted the main contractor with the supplier selection and project management of the implementation. 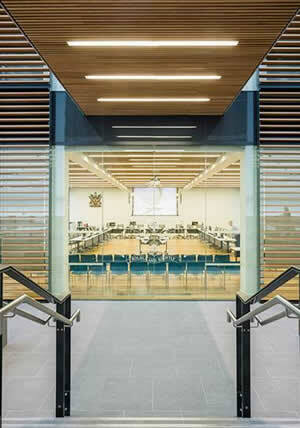 The building was opened by the Lord Mayor of London, Boris Johnson in November 2014 and the AV solution has been a great success.